Ladies in Beef introduced Great British Beef Week, their aim as an organisation is to raise awareness and support Red Tractor Farm Assured Beef, to increase consumer support for British Beef and to own and promote Great British Beef Week each year. Today marks the beginning of the 8th British Beef Week in eight consecutive years. From April 23rd until April 30th people in the industry work incredibly hard to raise awareness regarding the importance, quality and versatility of British Beef. Great British Beef Week also raises funds for those in need in the farming industry, by partnering with the Royal Agricultural Benevolent Institution. Eating high-quality British Beef is an excellent way to contribute to a healthy and balanced diet. 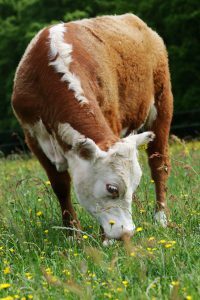 Our beef at Essington Farm is of the Pedigree Hereford variety and it is grass-fed (we do not use a supplementary diet of cereals which is overly common with modern continental breeds). Grass-fed beef has a number of health benefits including lots of natural vitamins and minerals. It’s a great source of conjugated linoleic acid (it is a fat that reduces the risk of cancer, obesity, diabetes and a number of immune disorders). Grass-fed beef also has the recommended ratio of omega 6 to omega 3 fats which is brilliant for a healthy heart. Buying food from Britain ultimately ensures high quality, great taste and high standards throughout the farming process. English Beef is a tradition to be proud of which champions quality and taste. The animal’s diet is the most important factor which determines the quality and taste of the beef. In other countries, farmers will feed animals other food which is not their natural diet, to fatten the animal up quicker or for other purposes to suit their own benefits. If the diet of the animal you are eating is not right, then this has negative impacts upon the health of the person who eats this meat. Supporting British Farming ensures that our British Countryside stays the way it is supposed to look, with animals and fruit and vegetables on the landscape. If you enjoy the picturesque nature of the countryside, local produce helps to save it. By keeping local farmers in business, it defends the countryside and ensures the land is not sold for another housing or business project. 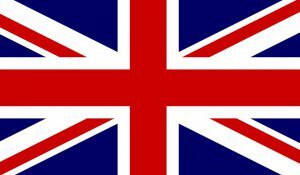 Buying British allows you to support local people, communities and families (farming is a living for the people who work on the farms and it is an occupation which would become extinct in our country if people continue to buy meat, fruit and veg from abroad). Buying beef from your own country reduces your carbon footprint and therefore reduces the impact that food travelling around the world has on the environment. British meat is produced to some of the highest welfare standards in the world: no growth-promoting hormones are allowed and any antibiotics are administered only under veterinary direction. Buying British Beef which has the British Red Tractor ensures that the meat was produced to a high set of standards at every stage of the food chain from rearing to processing, and can be traced back to the farm it came from. most proud of is our Pedigree Hereford Beef and we would love it if our customers both old and new would join us in celebrating Great British Beef Week by supporting local farmers and spreading the word about the importance of British farming, the health benefits of British Beef and also by purchasing food from a trustworthy and honest source. The piggies were right! We predicted it would be a hung parliament and the predictions were right (nearly!). Once again the opigion poll was more accurate than the professionals. The UPIG vote collapsed and the Piggeral Democrats failed to make much progress. A shock surge for Laboar nearly left them trotting ahead leaving Conservapigs to wallow in their performance. Thank you to all those who cast their vote in our Opigion Poll. Which little piggy is going to make it? Probably a hung parliament with Laboar, propped up by SNPIG – but i wouldn’t bet on it! With less than a month to go until the general election our Essington Farm Opigion Poll is in full swing. We have had over 400 votes and there is still time to show your party preference by June 8th 2017. This is something we do every election and is always very popular, last year it proved more accurate than the professionals! Currently Conservapig are hogging all the votes and trotting ahead with 51% of the votes leaving Laboar to wallow behind with 20% of the votes. Piggeral Democrats and UPIG are both currently heading to the sausage factory and sitting snout to snout having both received just 4% of the votes. There is still time to come and place your vote in our Opigion Poll and watch the pigs move closer towards the trough the more votes they receive. Visit our polling sty-tion to vote now! 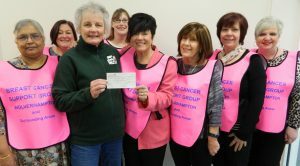 Last week we were delighted to be able to hand over a cheque for £3,500 to our charity of the year- the Wolverhampton and District Breast Cancer Support Group. The winner is Linda Jones who wins a table for two at our Valentines Dinner on Tuesday 14th February! Well done Linda. We have lots of exciting things planned for this year already. Make sure you put these dates in your diary and keep an eye on our website for more details coming soon! Monday 27th -Tuesday 28th -Pancake Day Menu, come and try some pancakes in our restaurant! What do Rosedene Farms, Boswell Farms, Redmere Farms, Willow Farms, Nightingale Farms and Woodside Farms have in common? Despite evoking an image of rural authenticity none of these farms actually exist. They are fake. They are ”farm” brands invented by supermarkets presumably to make food sound more appealing. The National Farmers’ Union (NFU) has written to National Trading Standards to complain about this misleading practice. Co-incidentally, a recent report from NatCen Social Research found that consumers have low levels of trust in supermarkets and imported foods. The horse meat scandal was cited as a reason for this lack of confidence in the food chain. Clearly there has never been a better reason to buy food from your local farm shop. You know where it has come from! See our horse meat video on our website, it will make you smile! We had a full house for our festival of pork evening. We are not sure when our next event will be as it depends on progress with the building works. Look out for news next month! Suffolk is a breed of sheep. The others are all pigs. Captain Pugwash had a ship called The Black Pig. Lots of you got 3 out of 4 but only one table got them all right, the Chatham/Brookes party who win a meal for two at the next event! We are holding our ever-popular pie night on Thursday 3rd of March from 6.30. Come and sample our range of homemade pies and a selection of homemade puddings: Great value at £12.95 for 2 courses. Don’t get caught out my Mothers’ Day this year as it is very early on the 6th of March. Book your Sunday lunch now as we are always full by the day itself. Alternatively, why not treat Mum to a special breakfast on Saturday 5th March from 9-11am. Enjoy a full Essington or smoked salmon and scrambled egg with tea, coffee, croissant, toast and buck’s fizz for only £12.50!